patch andi: Scraps by Denyse!! 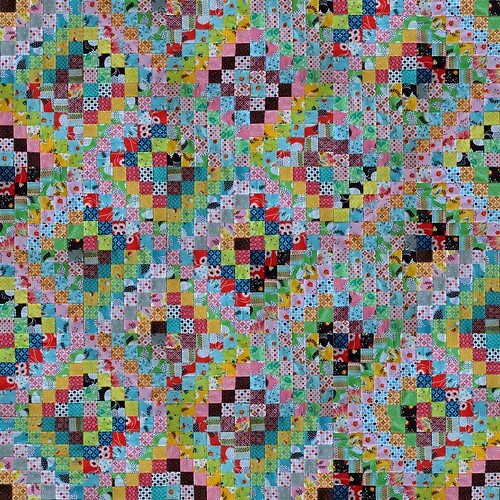 I have been looking for a scrappy looking quilt design to use for my "FMF-and-other-DS-fabrics" stash, and I came across this stunning quilt on flickr. My version will be 6 x 6 blocks, but as I have only made 6 blocks so far, I've used an online mosaic maker to mock up a possible end result. It will need a bit of tweaking but I think I'm going to LOVE this quilt. (Ella has already laid claim to it too). Have you heard I'm going to be teaching all about scrappy quilt making? Check it out here!! Love this one too - the detail and colours work! I love Megan's original quilt - and I'm gonna love yours too!!!!! Love those scrap quilts...it's going to look fab! It is going to be fabulous, I can feel it in my bones! I had to pop over here from Flickr and comment. This is going to be a great quilt! Wowza, it's wonderful! And congratulations on your class, lucky students! stunning! saw this on flickr and wow to the number of views! now get cracking and make it! it is stunningly beautiful. I'd reserve it too! So much loveliness! That first pile is so beautifully presented I would never be able to unfold it.